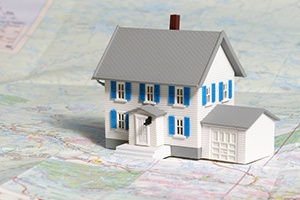 Is the Housing Market Rolling Over? I consider housing to be one of the key drivers of the economy. This is true from a fundamental basis—with housing driving construction and mortgage finance, which are significant parts of the economy, plus all sorts of indirect spending such as furniture. But it also holds true from a confidence and wealth-building perspective. Homeownership provides a level of economic security for most families that enables them to save and invest at higher levels, even before considering the substantial economic benefit of home appreciation. Housing matters for a reason. Buying a house, however, is a major commitment. Anyone buying a home is making a multi-decade commitment to pay the mortgage, as well as (usually) tying up a significant part of their life savings. You have to be quite confident in your future to do that. Indeed, the housing market tends to ebb and flow with the economy as a whole for just that reason. Housing is not only an enabler of future growth but also a good signal of how strong that growth will be. So, what is the housing market telling us? The data for housing has been weakening in the past several months. Now, it is time to take a closer look to see whether this sector is topping out. If so, it could be one more signal that, from an economic perspective, things are either at or close to as good as it gets. In the chart above, lower is less affordable. We can see that over the past several years, housing has become steadily less affordable. It is still, however, more affordable than in was in the 2000s. But the decline has no doubt cut off marginal buyers at the lower end of the income spectrum. 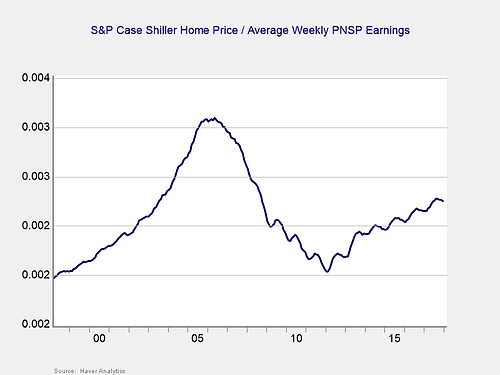 We can see that in the chart above, as the ratio of house prices to weekly income continues to rise. Housing prices have been increasing much faster than wages, but low interest rates have kept the affordability levels healthy. 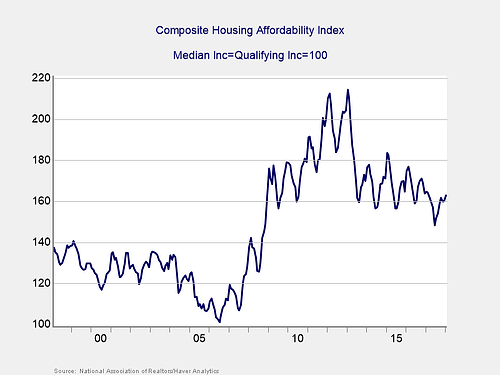 As rates start to rise, however, we can expect affordability to continue to erode, and at an increasing rate. 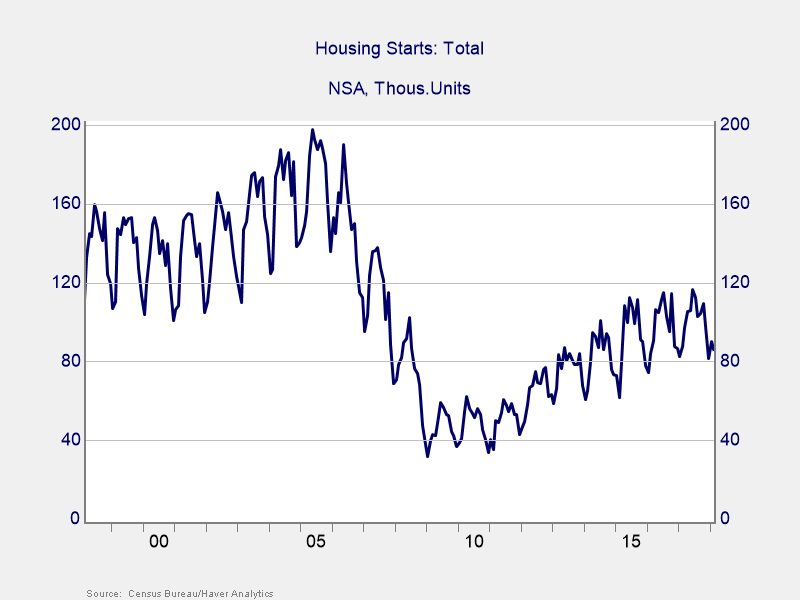 This suggests that housing may indeed have peaked. Lower affordability implies lower effective demand: people may want to buy a house, but their demand is not effective if they can’t afford it. Lower demand would also result in lower sales levels, perhaps in lower development levels, and in a rising supply of homes available for sale. When we look at the sales data, we can see that sales of new homes are running well below levels of the early 2000s, before the housing boom. 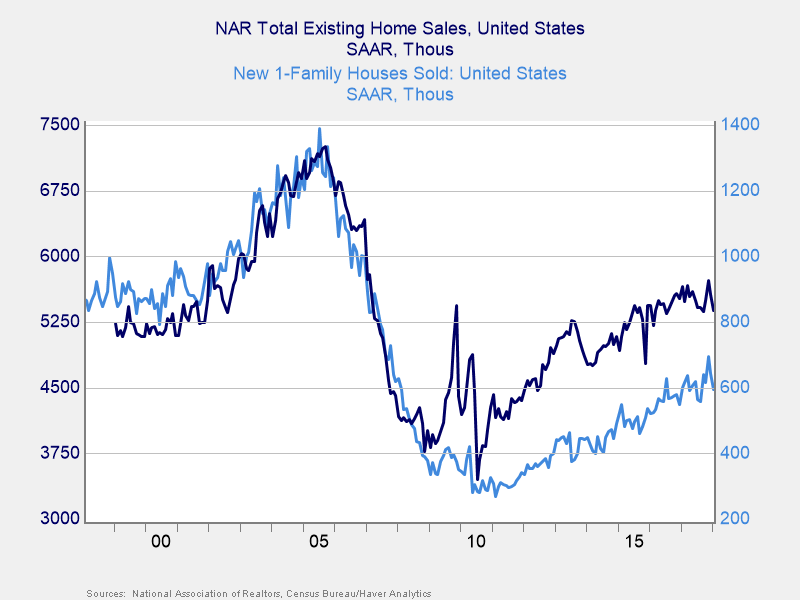 Sales of existing homes, on the other hand, have largely recovered to that level. This tells us two things. First, since existing homes are the majority of real estate activity, the market is pretty much back to normal (not much more room for growth). Second, new home sales look like they may be topping out as well. 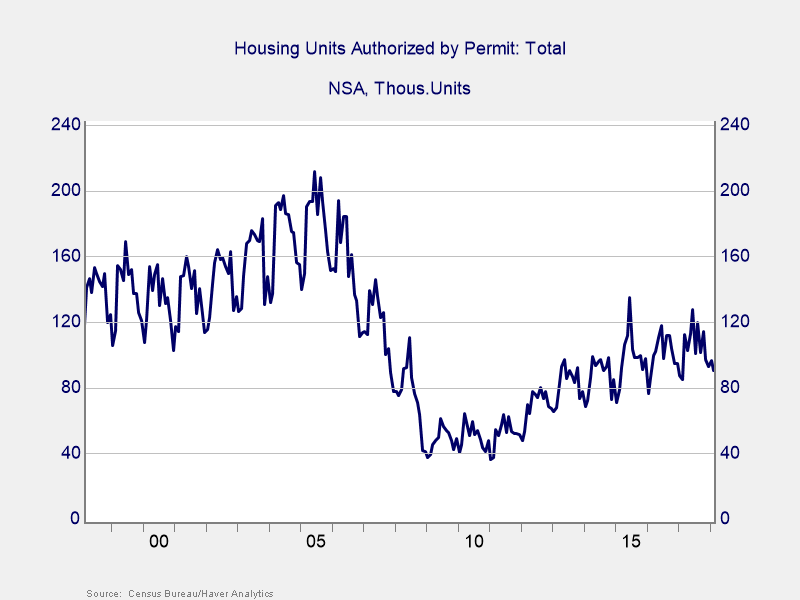 To check on that, we can look at actual housing starts, which seem to be topping, and at building permits, which have more definitively rolled over. Sentiment in the industry, which is surveyed monthly by the National Association of Home Builders, also looks to have topped out. We can argue whether housing is at the end of the cycle—probably not. What looks very likely indeed, though, is that the industry is past its best days for this cycle and is starting to roll over. If that is the case, we can also expect consumer confidence to start to roll over, and consumer spending to do the same. While this certainly is not a sign of immediate trouble, it is one more wide-ranging indicator that economic conditions are indeed starting to change—and not for the better. As I said the other day, now is the time to start thinking of what could happen when things roll over for certain.